Q-Connect C6 Envelope Wallet Self Seal 90gsm White (Pack of 1000) 7042 Pack of 1 Q-Connect White Envelopes. 90gsm Banker style envelope with self-seal flap. C6 114mmx162mm. Q-Connect C6 Envelope Low Window Self Seal 90gsm White (Pack of 1000) 7041 Pack of 1 Q-Connect White Envelopes. 90gsm envelope with self-seal flap and window. C6 114mmx162mm. 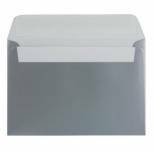 Plus Fabric C6 Envelope Wallet Self Seal 120gsm White (Pack of 500) F23470 Pack of 1 Plus Fabric Envelopes. White business envelopes manufactured from 110gsm heavyweight paper with press seal closure and supplied in extra strong boxes to keep the envelopes in pristine condition. Pack of 500. C6 - 114 x 162mm. 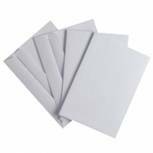 Envelope C6 White Gummed 80gsm Pack 1000 Pack of 1 Prestige white envelopes because presentation matters. Plus Fabric C6 Envelope Wallet Window Self Seal 120gsm White (Pack of 500) F22670 Pack of 1 Plus Fabric Window Envelopes. 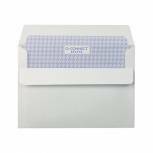 White business envelopes manufactured from 110gsm heavyweight paper with press seal closure and supplied in extra strong boxes to keep the envelopes in pristine condition. Pack of 500. C6 - 114 x 162mm. 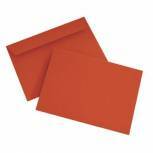 C6 Wallet Envelope Peel and Seal 120gsm Pillar Box Red (Pack of 250) BLK93012 Pack of 1 Get your mail noticed with these vibrant coloured 120gsm envelopes manufactured from environmentally friendly paper from sustainable forest sources. Wallet style with a Peel and Seal opening. Size - C6. Colour - Red. 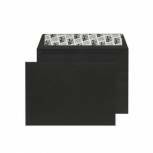 C6 Wallet Envelope Peel and Seal 120gsm Jet Black (Pack of 250) BLK93032 Pack of 1 Get your mail noticed with these 120gsm envelopes manufactured from environmentally friendly paper from sustainable forest sources. Wallet style with a Peel and Seal opening. Size - C6. Colour - Black. 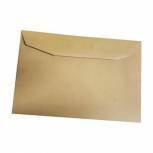 C6 Wallet Envelope Peel and Seal 130gsm Metallic Silver (Pack of 250) 112 Pack of 1 Get your mail noticed with these Metallic 130gsm envelopes manufactured from environmentally friendly paper from sustainable forest sources. Wallet style with a Peel and Seal opening. Size - C6. Colour - Silver. 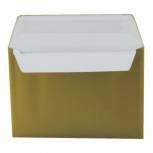 C6 Wallet Envelope Peel and Seal 130gsm Metallic Gold (Pack of 250) 113 Pack of 1 Get your mail noticed with these Metallic 130gsm envelopes manufactured from environmentally friendly paper from sustainable forest sources. Wallet style with a Peel and Seal opening. Size - C6. Colour - Gold. 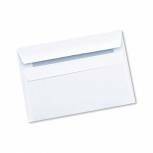 Q-Connect C6 Envelope Wallet Self Seal 80gsm White (Pack of 1000) KF02714 Pack of 20 Q-Connect White Envelopes. 80gsm Banker style envelope with self seal flap. C6 114mmx162mm.